NOTE: This post was written before the intensity of recent events on Mizzou’s campus (events that came as less of a surprise to those of us invested in this community than they did to the larger world). The job might be even more interesting and important now than it was a few weeks ago. It’s time for me to move on from what might be the most rewarding job I’ll ever have. For family reasons, I’ve moved from Missouri to Florida, and I’m teaching from afar this semester to bridge the gap between me and the lucky person chosen to do this job next. Will it be you? THE JOB, PART ONE: I’m the director of community outreach at the Columbia Missourian, a newspaper that covers the community of Columbia (a very cool college town). We serve the town, not just the campus, and we do it with transparency, integrity and depth. We also do it with a staff of students that turns over every 16 weeks. THE JOB, PART TWO: I’m an associate professor at the Missouri School of Journalism — part of the group of faculty members whose primary teaching duties lie in newsroom supervision. The professional/faculty editors who run the newsroom stay pretty darn consistent, with less turnover than any other newsroom I’ve worked in. But except for some paid students, the rest of the student staff is either brand new or in a new role every semester. It’s chaotic and crazy and so much damned fun. Work in a teaching newsroom full of smart, optimistic, dedicated journalists? Be given room to experiment and fail, with the understanding that the experiment is sometimes the highest good? Stop defending why journalists should talk about their audiences and care who consumes their content, because the newsroom has already drunk the kool-aid? Teach the next generation of journalists — the ones in your classes AND the 200+ every semester who work in your newsroom — that collaborative, audience-focused journalism is necessary, rewarding and fun? Keep adding to a deep toolbox of ways to highlight diverse community voices? Collaborate with dedicated colleagues, keeping your boss in the loop without having to ask permission for every idea? The Missourian’s community outreach team is made up of students enrolled in the Participatory Journalism class. I see my staff (plus some non-staff students) in class twice a week, then also supervise them in the newsroom. So I have a staff of 8-15 every semester (depending on enrollment), but they each put in just 10 hours a week or so. Our job on the team is to make the news more collaborative and social. And by “social,” I don’t just mean social media. I mean a genuine two-way experience and relationship. Feedback. Collaboration. Conversation. In-person socialization. Community voices. Measurement and analytics. Here are highlights of the kind of work we do. Some of it is work that stays with the outreach team, and some is designed to support and amplify the work of the rest of the newsroom. 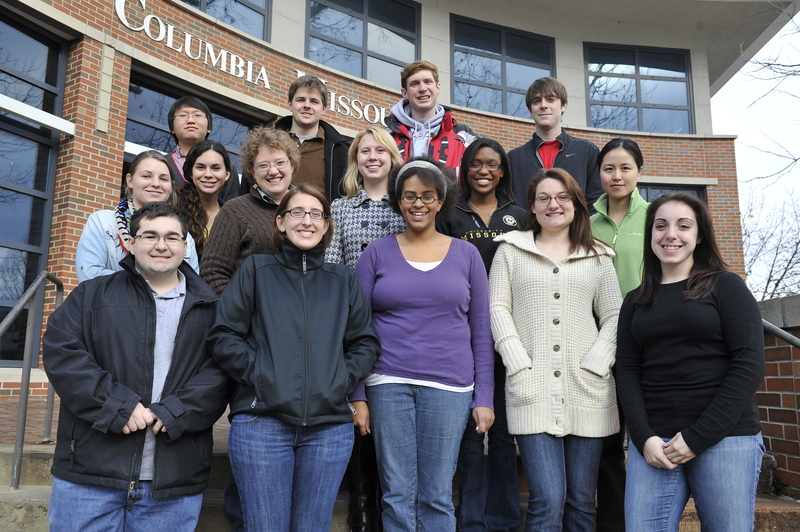 The very first community outreach team at the Columbia Missourian, in the fall of 2011. The community outreach team has been around since Fall 2011. I was the Missourian’s design editor for several years before I did a fellowship at the Reynolds Journalism Institute and refocused my work on audience engagement. When I finished the yearlong fellowship, I created a new role for myself and a new department in the newsroom. Okay, so now I’m feeling sappy. People who are happy at the Missourian embrace the chaos and fluidity of it. They take more pride in their students’ work than in their own. And they are willing to fully invest in their work because the work matters … more than most daily journalism, if I may be so bold. The stakes are higher than just today’s news report. The work pays dividends for years to come, as hundreds of students a year (seriously, hundreds) take what they learn at the Missourian into the world and hear our voices in their heads as they work. Personally, I want what they hear in their heads to include a relentless focus on the people the journalism is designed to serve. Can you help make that happen? To read the official job description and apply, go through http://hrs.missouri.edu/find-a-job/academic/ and use job code 18140. I’m happy to answer your questions.